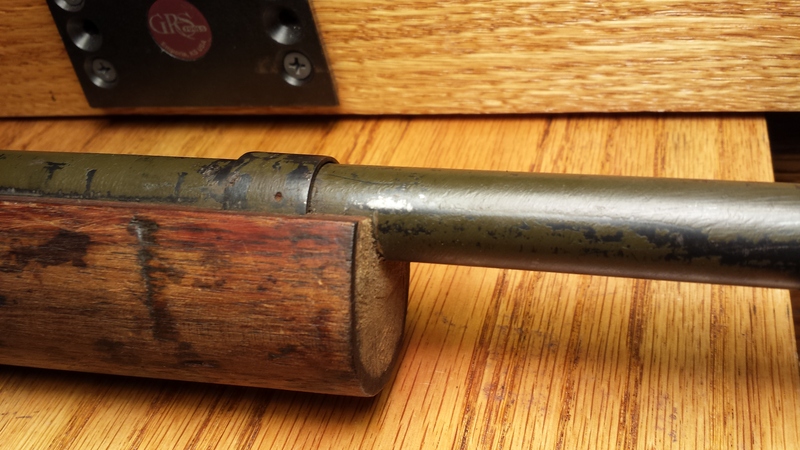 This old Coleman 10 gauge shotgun has been in my family for over 100 years, originally belonging to my great-grandfather. When I was growing up, I remember seeing it in the “meat house” on my grandmother’s farm. The meat house was really nothing more than a shed, a precarious structure that had a dirt floor and a pretty serious lean to one side. 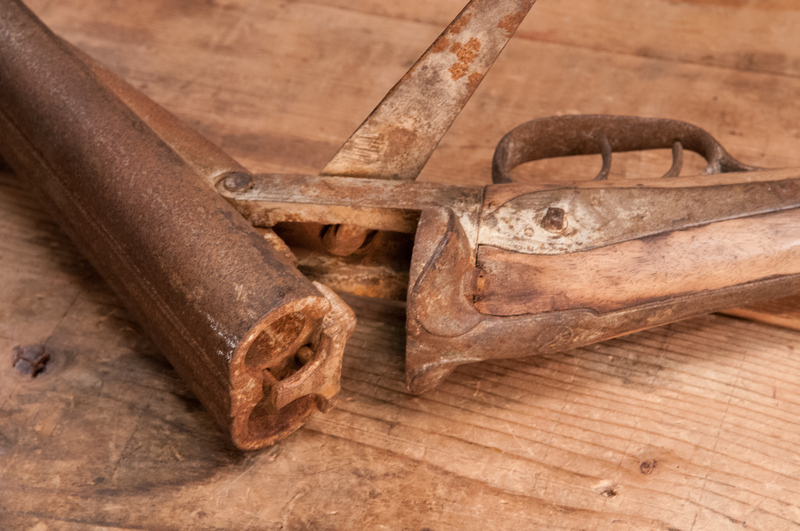 Even then, the gun was little more than rust and bleached wood. In the late 1970s, out of safety concerns, the meat house was emptied and demolished (actually, a couple of us just gave it a good push and it collapsed). 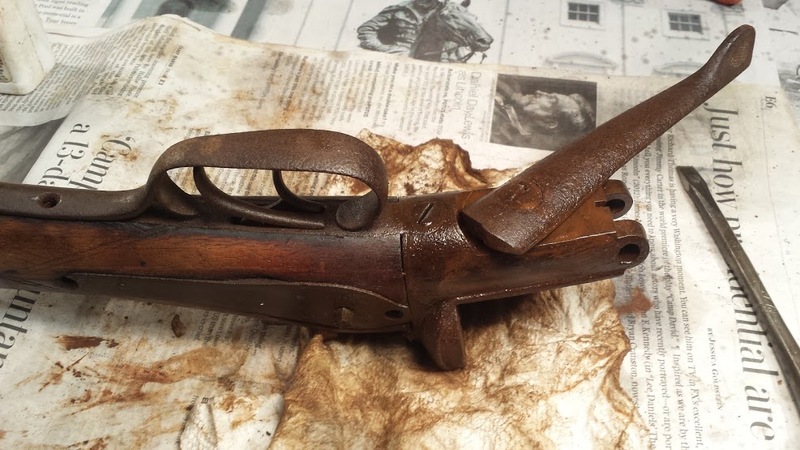 The shotgun was one of the many items removed and it found a new home in my parent’s attic. There it stayed for another 30 years until my mom finally sold her house and moved into a senior home. The gun was passed around a little over the last 8 years until finally finding its way back to me earlier this year. 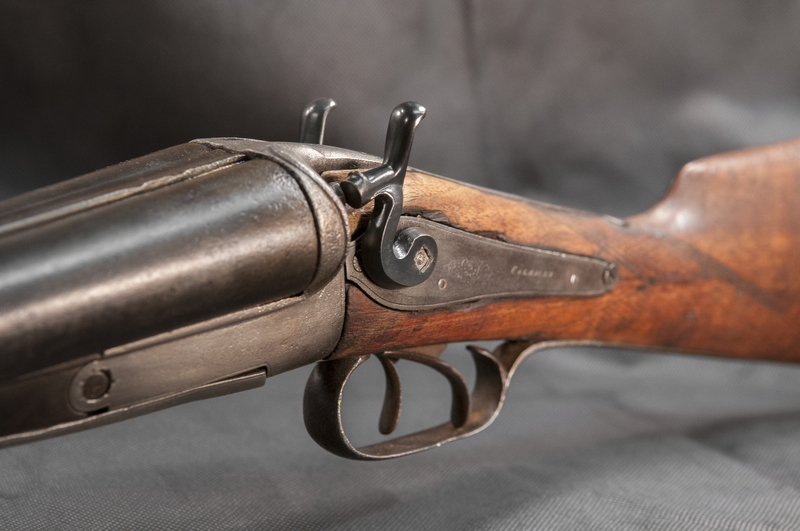 I wasn’t able to find out anything about the Coleman brand, and assume it was one of the many mail order or hardware store branded guns available back around the turn of the 20th century. Many of these were inexpensive imports, usually from Belgium. 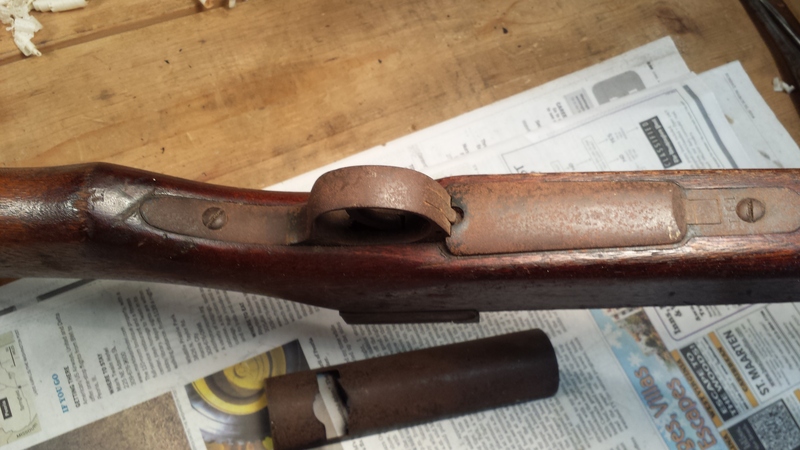 As you can see in the photos, the gun was in pretty bad shape, with decades of exposure and rust damage. It was also missing both hammers. 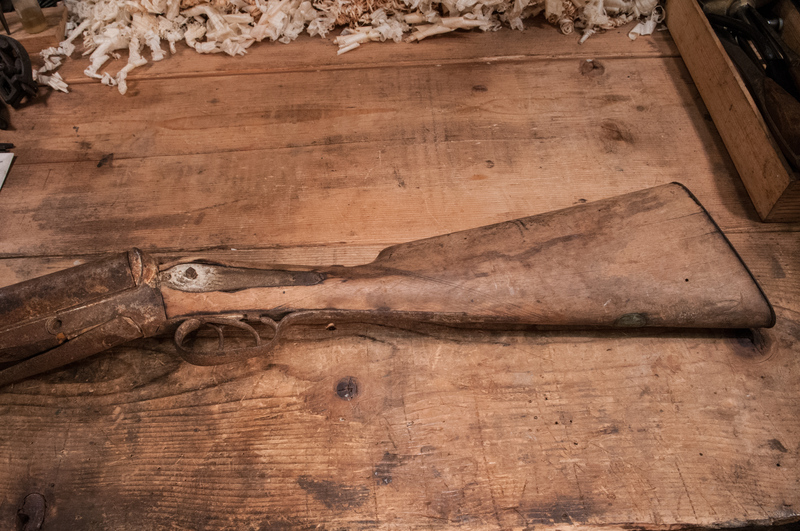 I’m not a gunsmith, but it was clear that this gun would never shoot again. Still, being a family piece I figured it might be restorable as a wall hanger. With little to lose, I dove in. The first order of business was disassembly. This proved more difficult than I had hoped. I was able to remove the side panels but a couple of key screws were completely frozen, making the rest of the action inaccessible. Believe me, I tried every trick in the book. There was just too much rust and some parts were simply fused together. Someone long ago tried to take the lever lock assembly apart to fix it and really buggered the whole thing up, even bending the lever. The wear on the lever’s locking mechanism was severe, and the lever is so loose it just flops around. Cleaning up the barrels was relatively straightforward. 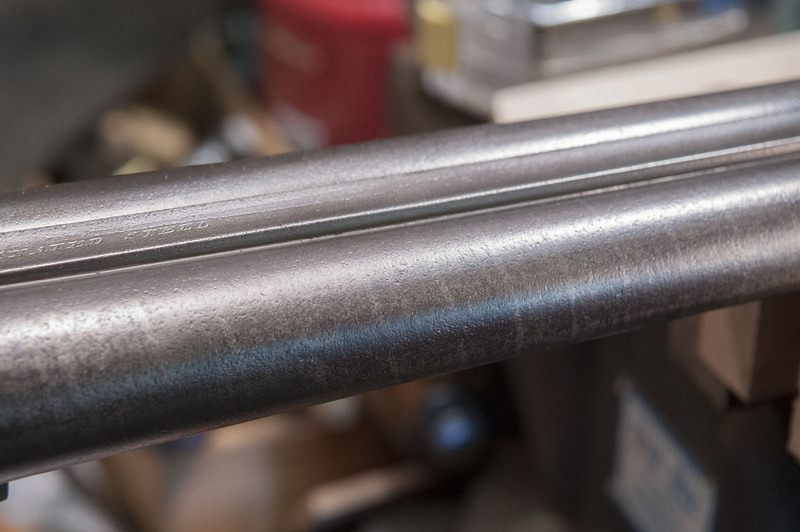 I removed the rust using a soft steel wheel brush on a large powered grinder, finishing up with more brushing by hand. You see in the photo below the pitting from years of rust and neglect. 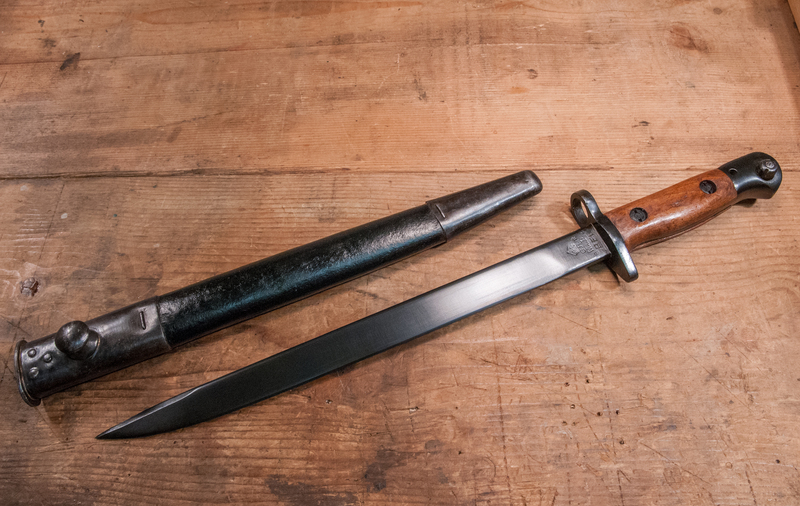 I applied a little cold blue to darken the metal to approximate a pretty nice looking aged patina. Although the photo flattens it out, there’s actually a pretty nice luster to the metal. 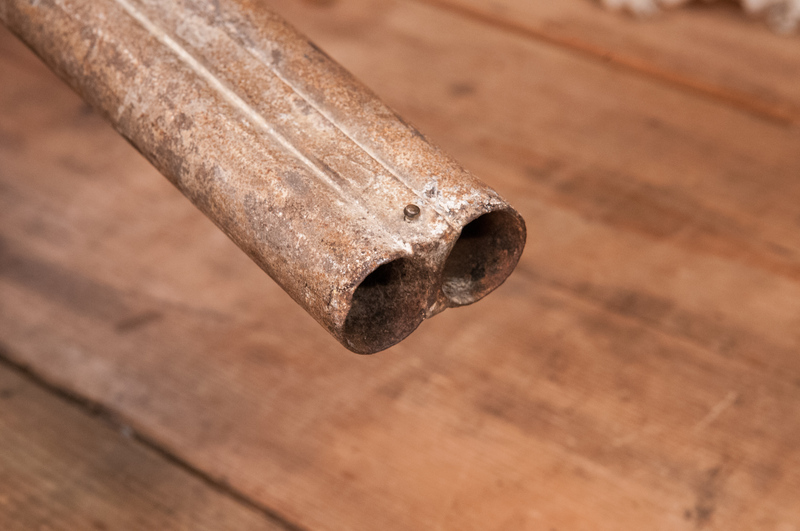 There was one small dent at the very end of one barrel that was easy to hammer out using a wooden dowel and a nylon hammer. I ran a brush and then a rag through both barrels to clean out the loose rust. Since I couldn’t separate the stock from the receiver thanks to one extraordinarily frozen bolt, I just had to do the best I could with it all in one piece. I managed to remove the action on both sides, despite one screw with a broken head. 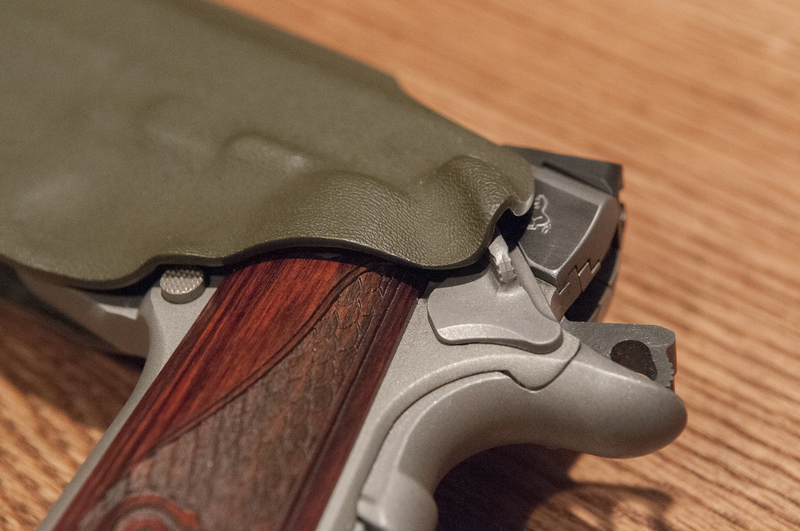 The actions were in surprisingly good condition compared to the rest of the gun. I cleaned up the rest of the receiver and trigger guard as much as possible. The damage to the metal was fairly severe so there were limits as to just how much I could do. 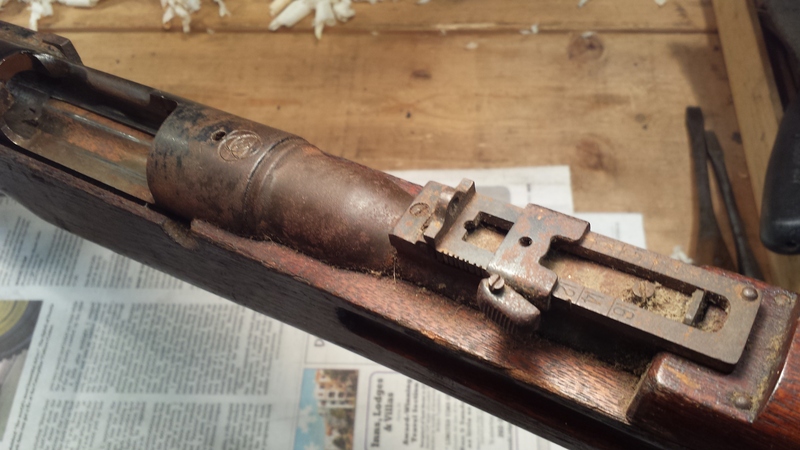 The stock had just a few trace spots of the original finish, and suffered from prior water and insect damage as well as some chipping around the receiver. I gave it a good scrubbing with mineral spirits and then applied several coats of Watco oil finish. I used a combination of both walnut and mahogany tints to get the color I wanted. The reddish mahogany adds a little warmth that I like. With the action cleaned and oiled, I reassembled everything, made a screw to replace the one that was broken. And when I say make, I mean I took a screw of comparable size, shaped and finished it to match the original as close as possible. Since the gun was missing both its hammers, I had to source replacements. This would have been a more critical endeavor if this were a shootable gun, but being a wall hanger, I only needed hammers for cosmetic reasons. I searched for vintage hammers, but finding a matched pair that were the right size was difficult and I didn’t want to spend a lot. 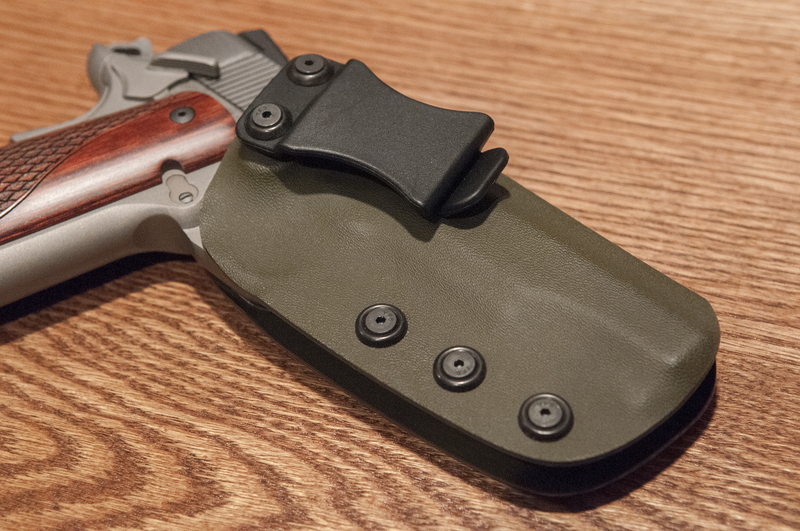 I ended up ordering a new pair from Dixie Gunworks. Being new castings, they required a considerable amount of work filing, drilling, sanding and polishing. Given the condition of the rest of the gun, I didn’t go overboard making them look perfect. I debated whether or not to blue them and in the end went ahead. I like the contrast with the rest of the receiver. 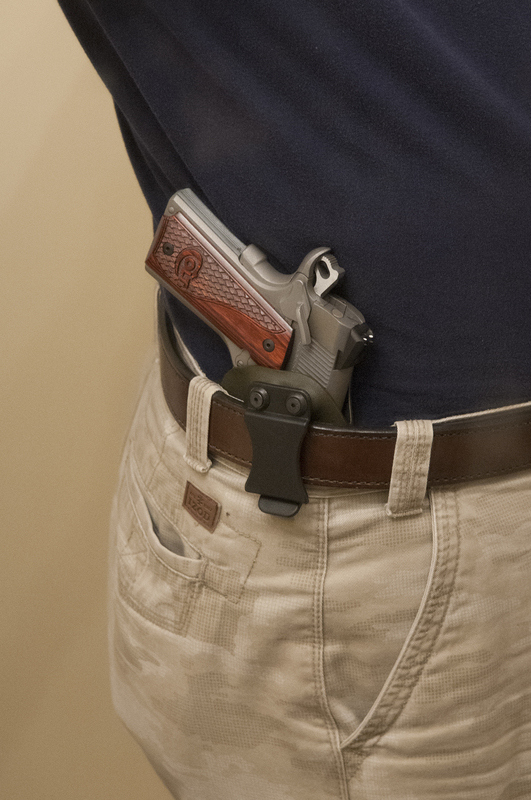 Attachment to the gun appeared to be friction fit. I have no idea if this was how the originals were attached, but the posts (or whatever you call them) were solid. So friction fit them I did. I filed them for a tight fit and pounded them on using a wooden dowel to protect the finish. All in all, considering the condition when I started, I think it turned out pretty well. It’s still a rough looking piece, but it looks a darn sight better than when I started, and at least now is presentable enough to hang somewhere. 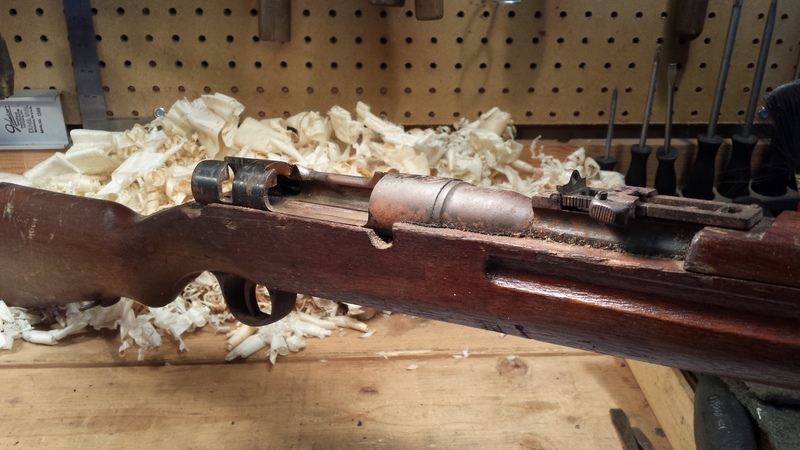 The recent successful completion of the Lee-Enfield restoration has me inspired to work on a couple of other neglected firearms that have been in the family for decades. 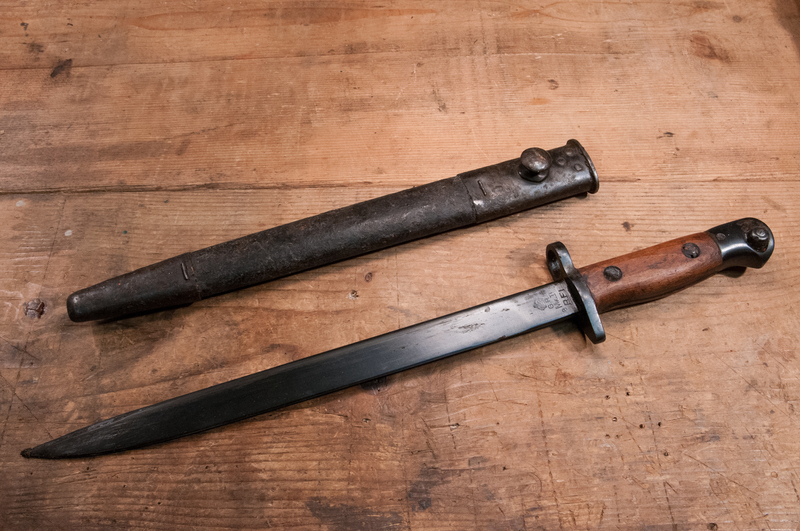 My dad was in the navy in WWII and brought home a Japanese Arisaka rifle from the Philippines. He never talked much about the war, and all he had to say about the rifle was that there was a pile of them that were free for the taking. So, he brought one home. Fortunately, he never tried to shoot it; more on that in a moment. The rifle was stored in our attic from the time the house was built in the late 1950s until 1983, when my mother moved closer to town. It went straight into that attic until 2006, when she moved into a retirement facility. Unbeknownst to my brother and me, she gave it to a family friend. Since each of us thought the other had it, the rifle never came up in conversation until last summer, when I happened to ask about it. Long story short, the family friend graciously returned it to us, along with a side by side shotgun that is in horrendous condition. 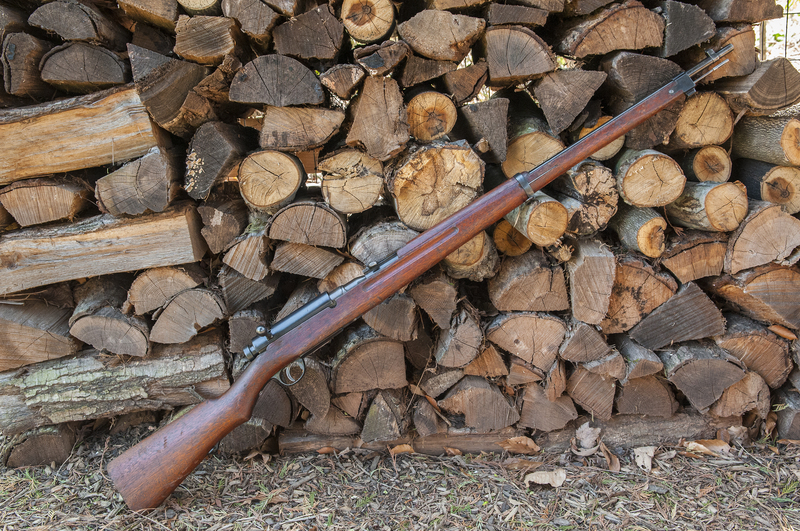 I don’t know the rifle’s condition when my dad picked it up in the Philippines, but having spent 70 years in attics since, the Arisaka accumulated a lot of dust and rust. The wood was in fair condition, but very dry; all the metal surfaces were rusty and most of the original bluing was gone. 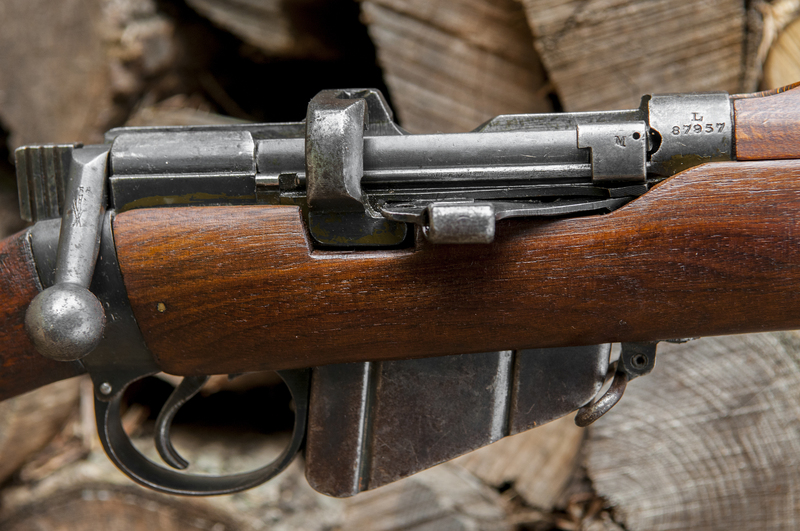 After doing some research, I’m 90% sure this particular Arisaka was strictly a training rifle, and was never shootable. It appears to be some sort of type 38/type 99 hybrid with a mixture of parts from both designs. 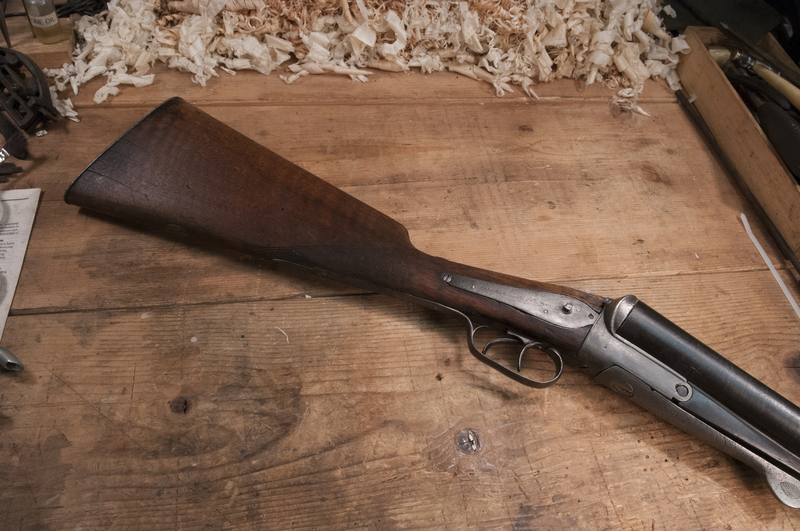 The biggest giveaways are lack of a serial number and proper hallmarks, and the fact that the barrel isn’t rifled. 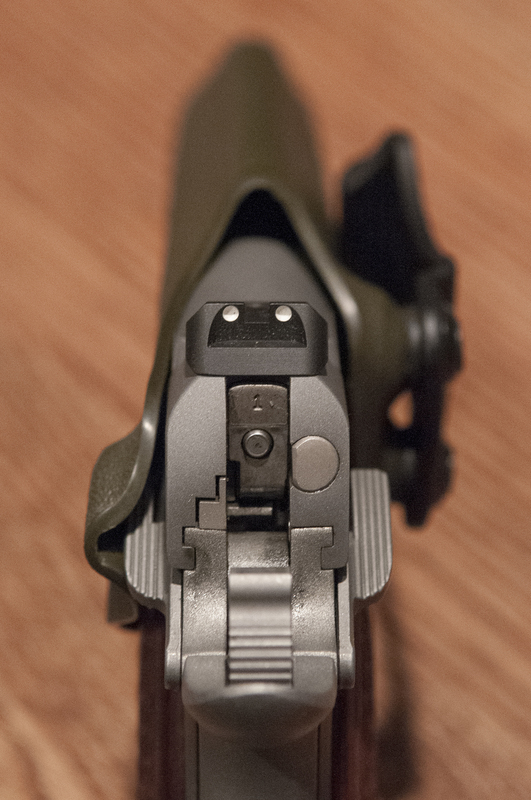 It is interesting, however, that it does seem to have all the correct mechanical parts of a fully functional rifle, including the firing pin, magazine spring, and the action dust cover, which is normally missing from all Arisakas. 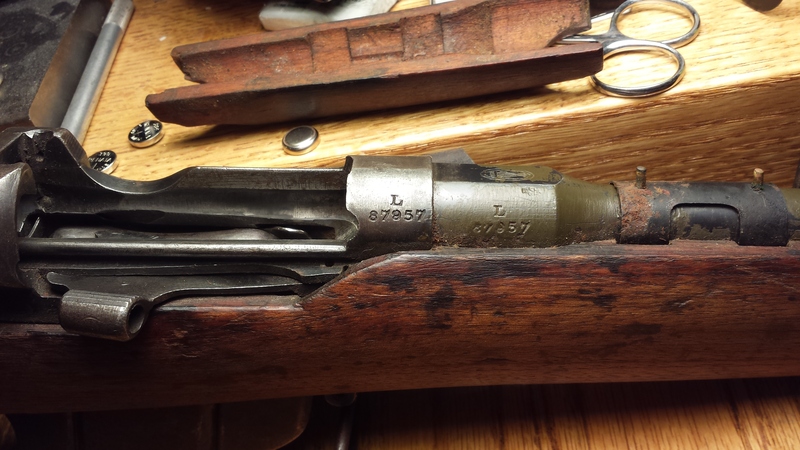 That one part, seen in the photo below, is probably worth as much as the rest of the rifle. These training rifles are not uncommon, but they were not constructed to handle live ammo and are likely to explode if shot. The receivers were made of cast iron and intended for either wooden rounds or low power blanks. Because they are virtually indistinguishable from the real rifles, a lot of GIs who brought them home after the war tried to shoot them. The consequence of doing this was not pretty. This earned the later Arisakas a reputation for being poorly made and these are sometimes (incorrectly) referred to as Last Ditch guns. 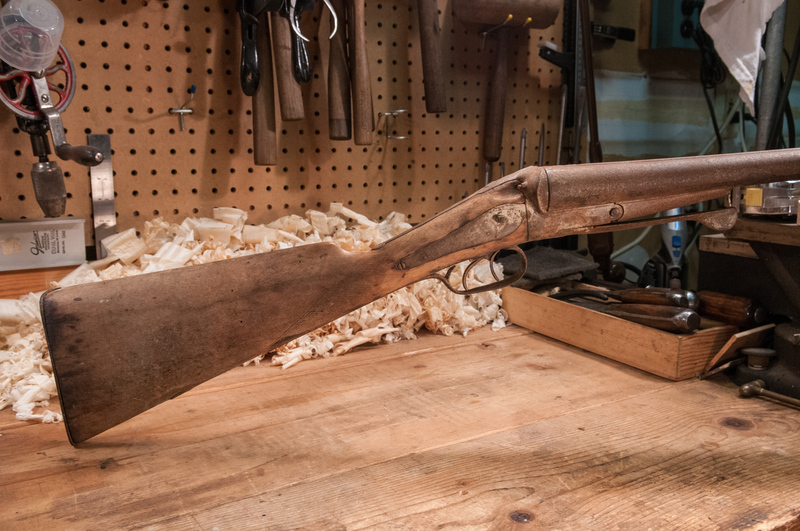 Since I didn’t have to worry about shooting it or compromising its value (it’s a $50-$100 gun at best), the restoration focused primarily on the cosmetic, with mechanical function a secondary concern. Fortunately, none of the screws were seized and the rifle disassembled quickly. Compared to the Enfield, taking this one apart was a breeze. The rust turned out to be mainly superficial, and came off pretty easily with some CLP and light brushing. The receiver and barrel required a little more aggressive scrubbing with the CLP and steel wool, but cleaned up very nicely. Once cleaned and degreased, I used a cold blue oxidizing agent to darken the metal areas that were overly brightened by the cleaning. 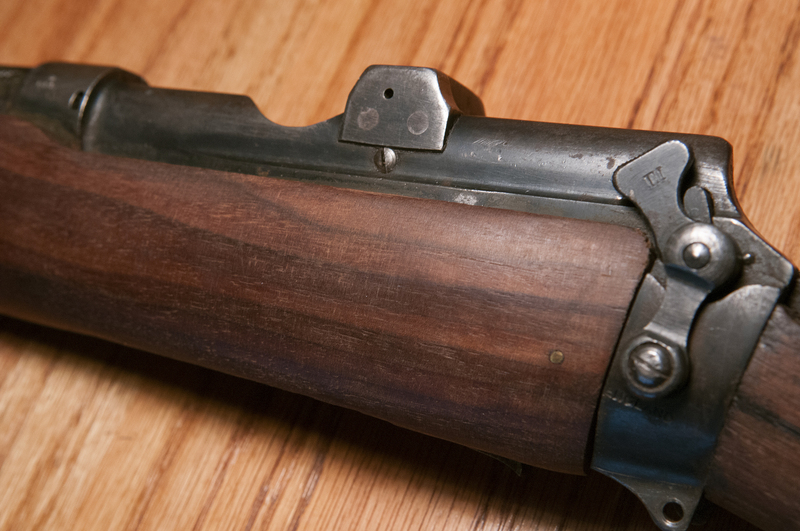 This toned it down to a perfect match to the overall patina of this 70-year-old firearm. 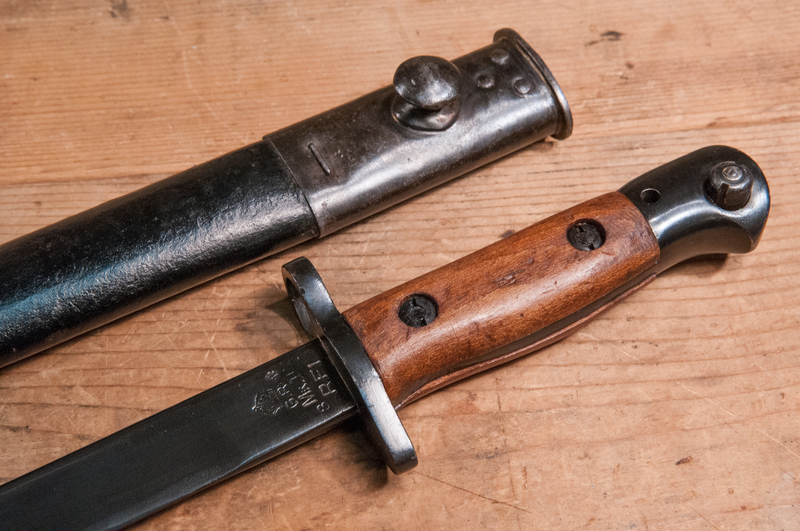 With a little light surface toning, the result was a rich and lustrous dark blue/gray finish that accurately reflects the age and matches the remaining patina. The stock, as I said, was overall pretty good, but the wood was very dry and splintery, and there were a lot of scratches and dings from laying bare in attics, etc. A few applications of Kramer’s Best had it looking much better, but I still wasn’t satisfied with the result. After looking at it and thinking about it for a few days, I decided to give it a light application of Watco Danish Oil, which is thin and penetrates well, and is great stuff overall. Unlike many finishes, it builds up very slowly with a low sheen, and plays nice with other existing finishes in my experience. 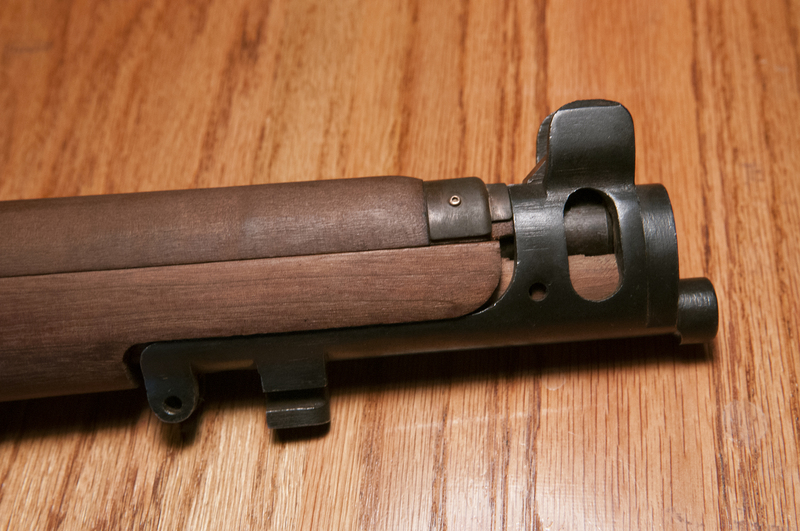 I used a mahogany tint that matched the original finish on the rifle, and gave it just a single application. The result was a remarkable improvement. Scratches faded, tone evened out, and the overall surface just felt better in the hand. Reassembled, the rifle looks great. Since it’s not shootable, it will never be anything other than a wall hanger, but that’s okay. It’s a piece of history and a link to my dad.